SCARCE does NOT accept used medical equipment or supplies. Please reference the resources in below. If you have used medical equipment or have extra medical supplies around the house, there are lots of options for donation. So many options can make the process a bit daunting. Here we try to narrow it down to make it easier for you to help someone in need and the planet. Items must be clean before donation. Items should be in working order or (depending on the organization) only require minor repair. Medical supplies or medications generally need to be unopened and unexpired. Medication: Do NOT flush unwanted medication or place in trash. Drop-off locations are available for safe disposal. DuPage County locations may be found here. View Chicago-area locations outside DuPage County here. Medical Supplies (except sharps): Broadly speaking, medical supplies are not recyclable. Dispose of in the trash so long as they do not contain medication or needles/sharps. If you have questions on specific items, you can contact us. Sharps/Needles/Syringes: Do NOT throw loosely into the trash. Collect in a rigid plastic container with a lid, such as a detergent bottle. Follow the steps here on safe disposal and view a list of drop-off locations. Medical Equipment: Non-motorized items that are primarily metal, such as canes and walkers, may be recycled at a scrap metal recycling facility. Batteries should be removed from motorized equipment and disposed of at a hazardous waste facility. You can also contact a junk removal company if you are unable to donate items. They will typically do their best to deconstruct and recycle equipment. A number of organizations accept medical equipment and supplies in good condition. Exactly what an organization accepts may be affected by their current stock of items as space may be limited so it is always best to call each organization. These are just a few in our area. ALS Association of Greater Chicago (Chicago): Devices go to uninsured or under-insured people in the Chicago area. Fill out online form to start process. They arrange for pick up of items. Association of Horizon: Provide summer camps and gatherings for adults with physical disabilities. Accept hospital beds and hoyer lifts with slings may be able to accept other items as needed. Contact by phone or email to inquire about your items and arrange for pick up. 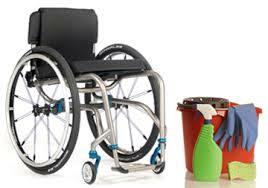 Devices for the Disabled (Chicago): Redistributes equipment to those in need in the Chicago area. Accept power wheelchairs, manual wheelchairs, rollators, patient lifts, canes, shower chairs, and hospital beds. Muscular Dystrophy Association (Chicago-area): Accepts most medical devices. Must be no older than 5 years and be in new or gently-used condition. Can usually provide pick-up. The process typically takes a few weeks. Contact Emily Hall at 312-873-1440 to get started. Project C.U.R.E. (Woodridge): Accepts a wide variety of medical supplies, equipment, and some medications and supplements. Items are shipped abroad to medical facilities in need around the world. They will accept some supplies past their expiration date, such as gloves. The Kids Equipment Network: An all-volunteer group that takes donations of medical equipment to help children get the devices they need. You must fill out an online equipment donation form to get started. UCP Seguin (Tinley Park): Accepts durable medical equipment. May be able to provide pick-up within Chicago-area. Contact for more information. Unity Hospice: Accept items on a case-by-case basis. Items they commonly accept include wheelchairs, Oxygen concentrators, nebulizer machines, hospital beds, low air loss mattresses, wheelchairs, geriatric chairs, walkers, shower chairs and benches. Do offer pick up if approved. Call 312-427-6000. Please note: Unity Hospice is a for-profit company. You can also check to see if a local organization such as a church, senior center, or veterans organization has a loan closet for medical equipment. Great Lakes Loan Closets has a limited listing for Cook and Lake Counties. This resource has a partial listing for North Suburban and South and West Suburban loan closets. 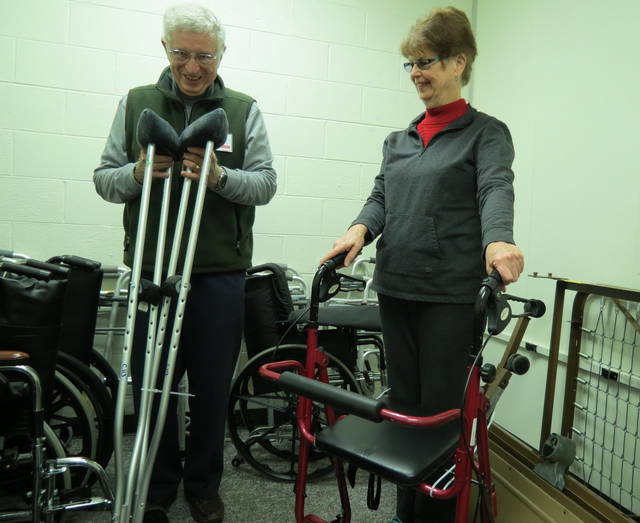 Loan closets typically take items that are non-motorized such as wheelchairs, walkers, canes, crutches, tub transfer benches, shower chairs, and commodes. When searching online, try using the search term “Loan Closet” or “lending closet” and include the name of your county or town to find some options in your area. Most accept donations of items as well as loaning them out. The American College of Surgeons has a long list of organizations that accept medical equipment and supplies for reuse. Med-Eq is a website that allows individuals to list medical equipment and supplies they are interested in donating. Non-profit agencies are able to browse the online listings for items they need. The website is a nationwide platform and states that about 30% of the items listed are matched with an organization in need. Basic items such as crutches and walkers can also be donated to Goodwill. If you’re tech savvy, consider sharing online for neighbors in need by listing items on Facebook marketplace, NextDoor, Craigslist, LetGo, Freecycle or OfferUp.